Late last year saw the opening of Mireio (mee-reyo), a Provencal inspired brasserie in Raffles Makati. Hints of a French restaurant opening on the 9th floor has been around ever since the hotel opened. Fast forward to a few concept changes and we now have Mireio with Provence born Chef de Cuisine Nicolas Cegretin at the helm. 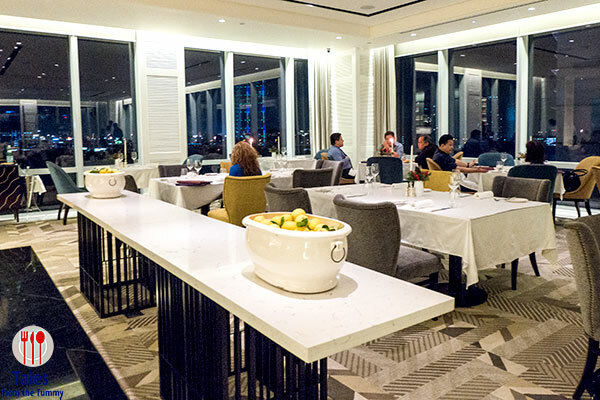 A beautiful restaurant with a chic yet relaxed design peppered by numerous art pieces and excellent views of the Makati skyline. People my be wowed by a wall of wine but the one filled with multi colored oils behind the dessert station just excites me more. 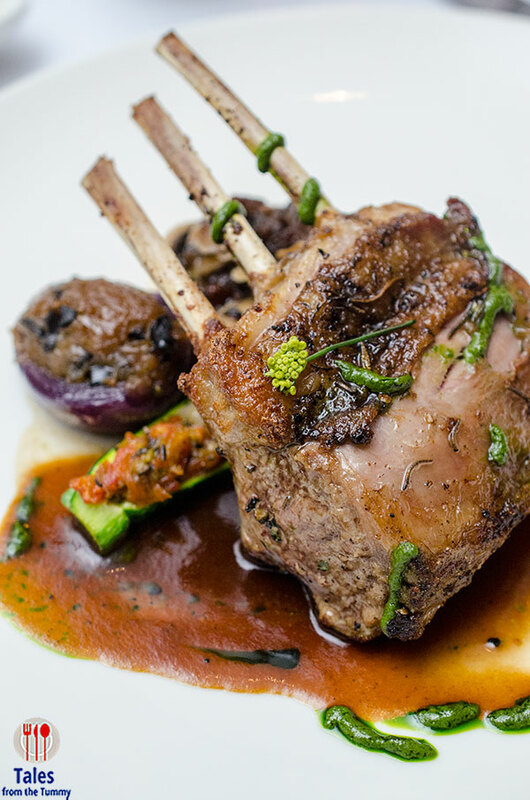 They have a small menu that is focused on quality ingredients and expertly prepared to give a feel of Provence in every bite. Tomato Tart (P510) with clams, snail, rocket and Parmesan. This ranks up there as one of the best appetizers I’ve had. 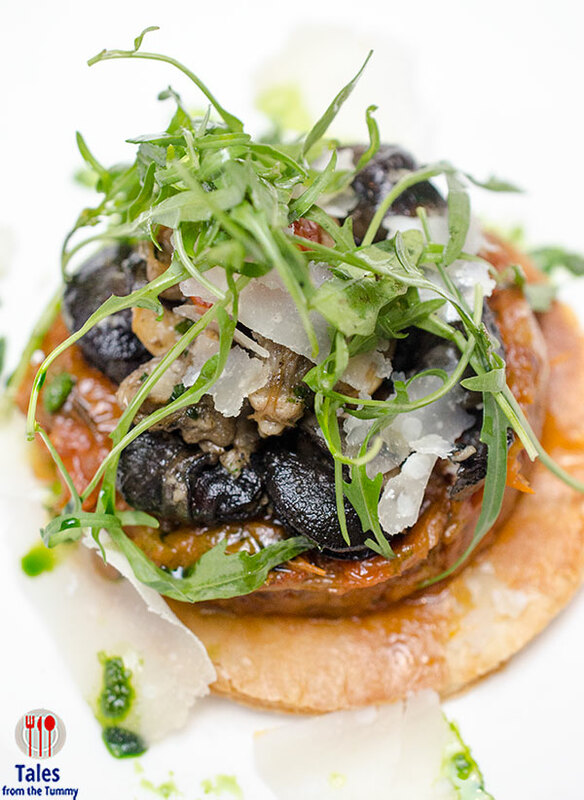 A crisp pastry with stewed tomatoes topped with clams and escargot. Eat it like a pie so you get all the ingredients in one bite so you’ll fully experience the flavor bomb that this is. 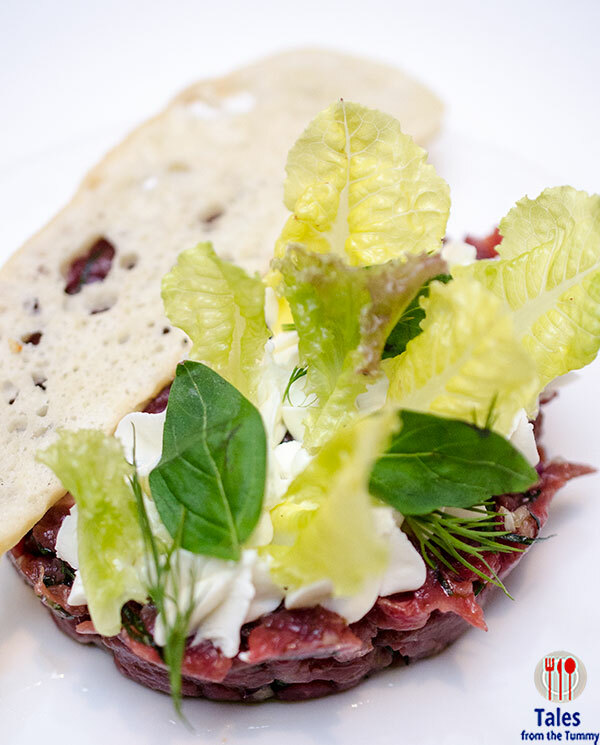 Beef with Goat Cheese Tartare (P420/starter, P720/main). The tartare is well season, had good and fresh beef flavor while mixing in the goat cheese gives it an even creamier mouth feel. 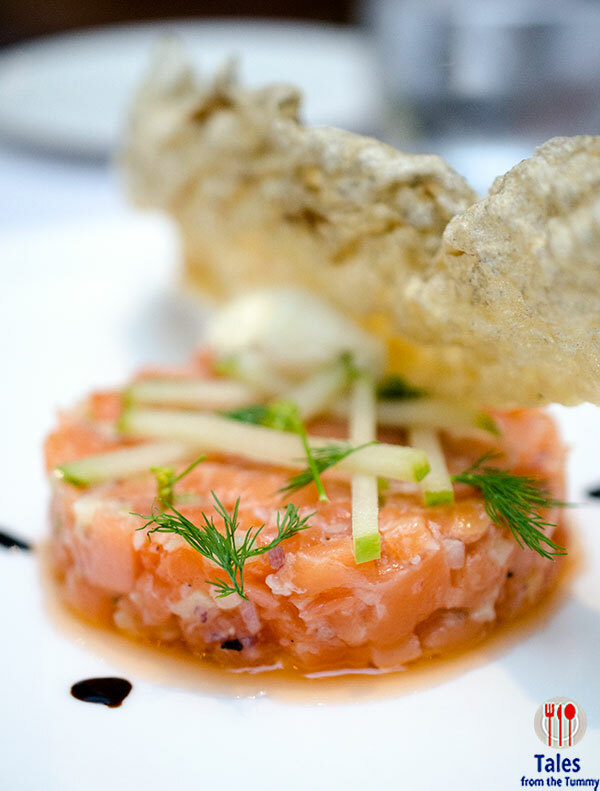 Fresh and Smoked Salmon Tartare (P520/starter, P820/main) with Granny Smith apples and Dijon mustard cream. This is pretty different because it uses both smoked and fresh salmon so you tastes different preparations in one mouthful. The granny smith apple slivers and the large fried salmon skin play textures contrasts. I highly suggest this dish for people who enjoy salmon. 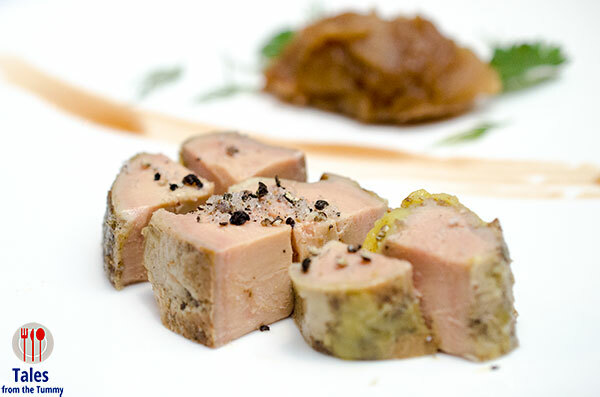 Roasted Duck Foie Gras (P650) with Granny smith apples and ginger chutney. If you are feeling indulgent but I suggest that you share this, I only had a 1/6 portion and I was good. The chutney is good to cut some of the richness. 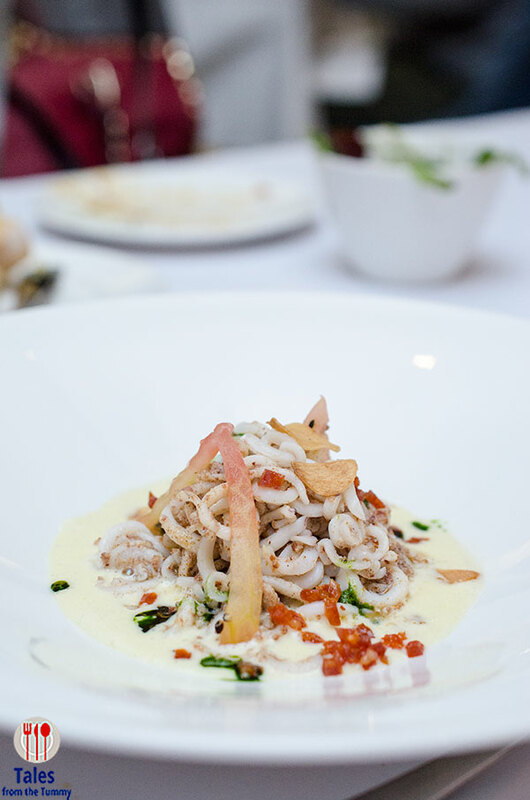 Sauteed Calamari (P550) with sweet garlic cream and chorizo oil. This was the appetizer that surprised us, presentation wise it was nothing special until you put the first forkful into your mouth. The sweet flavors of the tender calamari enveloped by the silky cream and the pungent oil will have you reaching for another forkful after another. 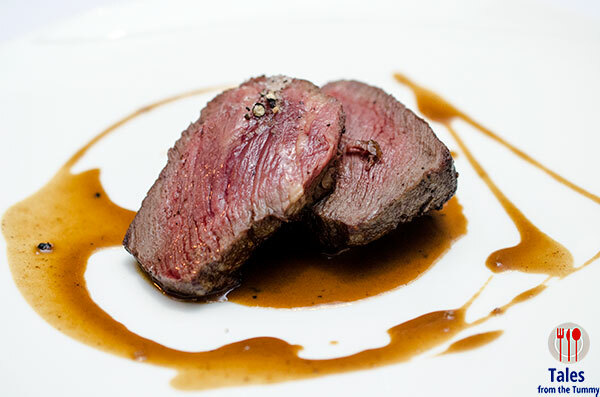 Grilled Butcher’s Choice Beef (P1,550), served with sauteed potatoes and black pepper sauce. A safe order for people who don’t like to venture out with their palate. Cooked perfectly with a tasty pepper sauce. 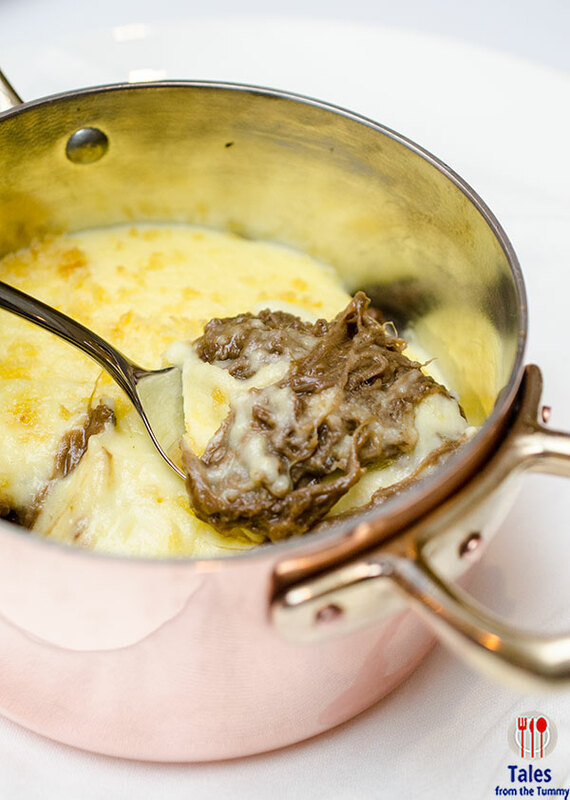 Slow Cooked Ox Tail Parmentier (P1,450) with black truffle jus and mesclun. My eyes settled on this item on the menu because it was different. Once laid down on my table I knew I made the perfect choice. Served in a copper pot that you can’t help but take a picture of with a visible bed of mashed potatoes. Dig in and see the almost melting ox tail, you’ll get a little texture surprise when you taste the crunch from the bread crumb topping. The closest thing to this is a shepherd’s pie. Roasted Rack of Lamb (P1,780) with traditional stuffed vegetable nicoise. Irene got her usual lamb dish and look how pretty it was. Nice charring on the outside with 3 chops sticking out plus colorful stuffed vegetables. Don’t forget the stuffed vegetables as they are very good. 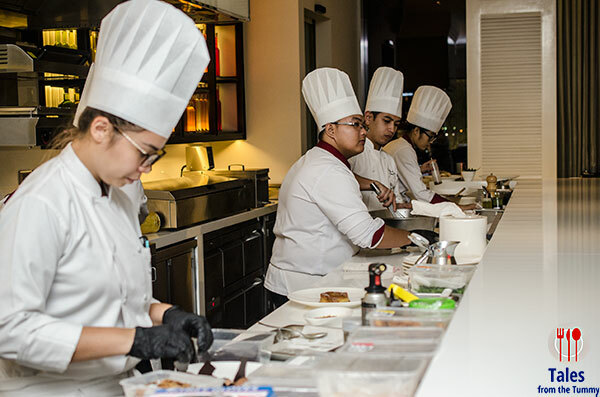 This is the dessert station where they make each and every plate of dessert which of course includes the aroma of items coming out of the oven. You can have your dessert at the main dining area or ascend a flight of stairs to reach the Mireio lounge and have it served there. 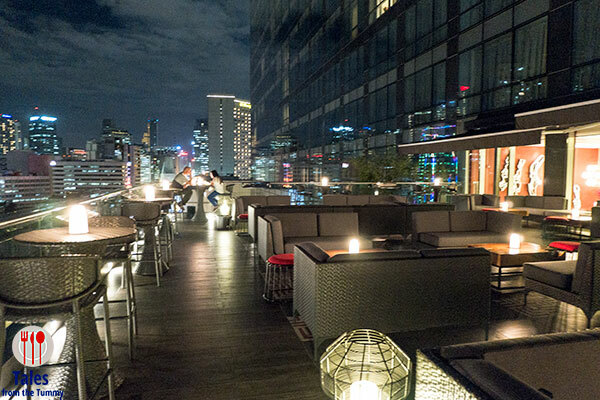 The lounge features a small air conditioned area plus a large al fresco portion surrounded by the lights of Makati. 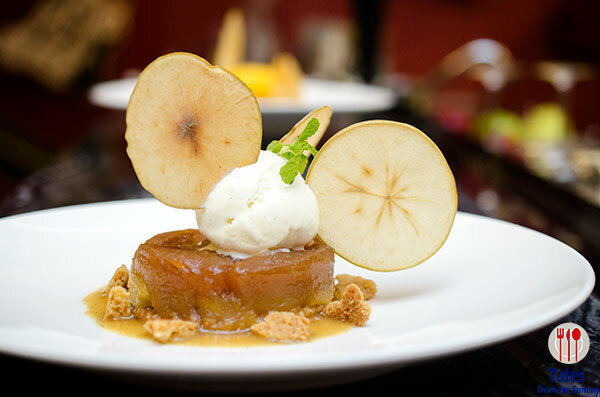 Apple Tart Tartin with Vanilla Ice cream (P450). Find the hidden mickey right in the middle of your plate. Loved the classic French flavors but plated whimsically. 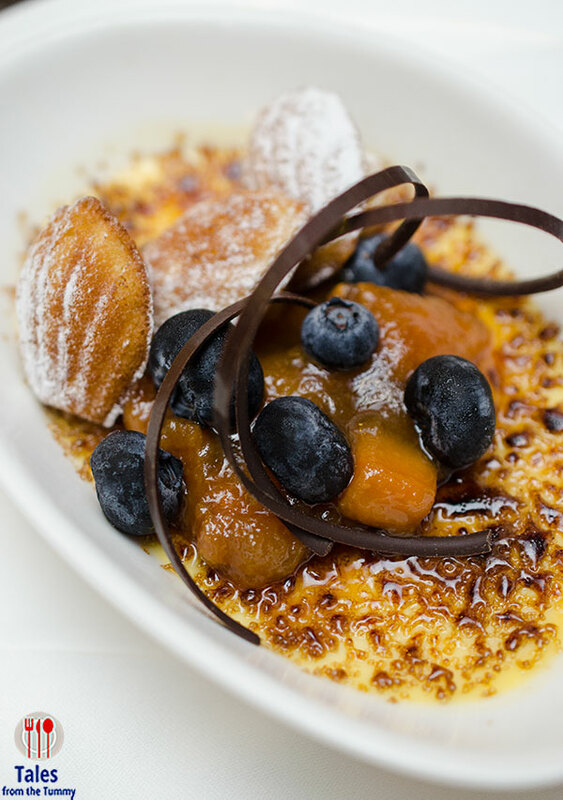 Lavender Creme Brulee (P450), topped with lemon madeleine and fruit compote. Lavender is not something everyone likes so if you hate it then you’d better skip ordering this as the flavor is evident in each bite. I, on the other hand, love it. The toppings add a break int he taste but I could do without it and concentrate on the pure lavender creme brulee flavor. Rum Baba (P450). Don’t you just love how that name rolls off the tongue. 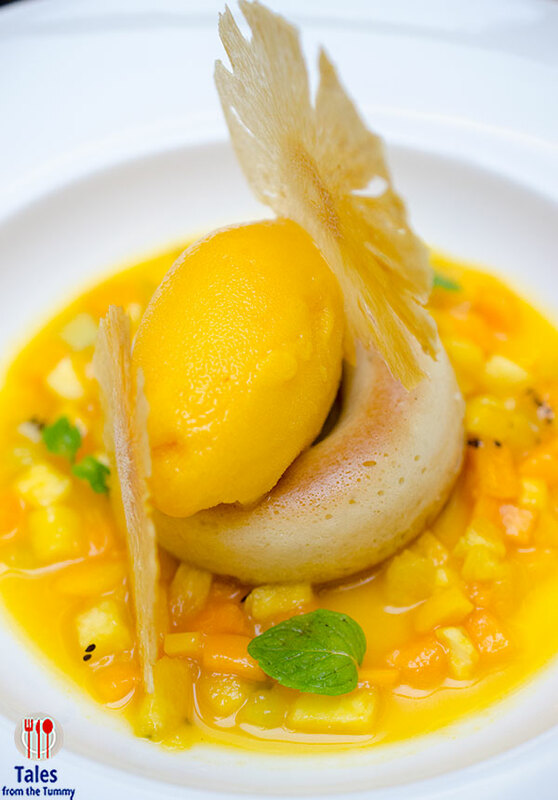 The rum baba sits in the middle atop fruits and a hidden coconut and lime panacotta then topped with mango and passion fruit sherbet. 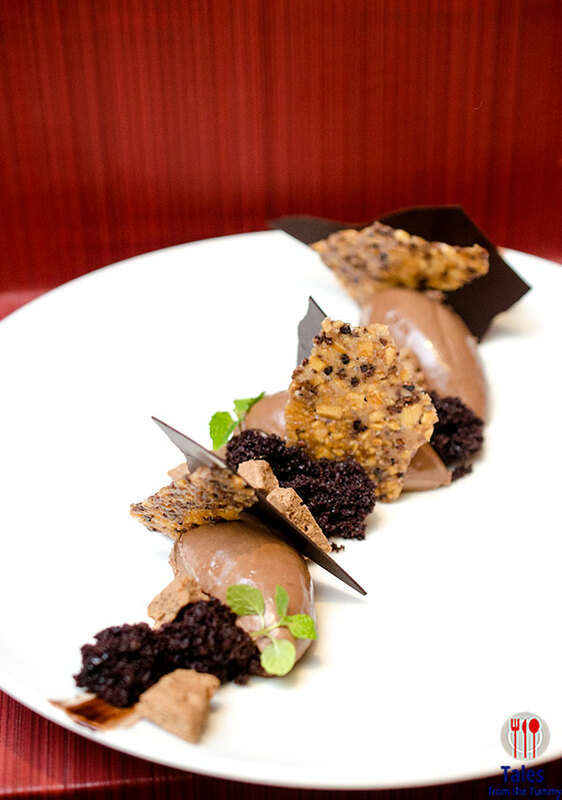 70% Guanaja Chocolate Mousse (P450). Chocolate lovers will love this to bits but you know I’m not a fan so I just tried the crisp hazelnut crust. Prices are on the high side but they do have beautiful views, great ambiance and an easy to enjoy menu filled with great dishes.